In fact, endowed professorships and fellowships are fundamental tools used by the College of Business to attract, reward and retain faculty who are known throughout academia as “triple threats” (professors who excel in teaching, research and service). One of these endowed positions, the Hamilton Family Faculty Fellowship in Finance, was established in 2014. Ed Hamilton, a member of the Dean’s External Advisory Board and the Henry J. Rehn Society, established the fund to support outstanding faculty with a commitment to sustain excellence in instruction. SIU College of Business Hall of Fame member Gregory A. Lee endowed a professorship in management. The 1972 marketing graduate also serves on the Dean’s External Advisory Board. The college is eternally grateful to the families and corporations that have made it possible to endow these positions and support its world-class faculty. The leadership, faculty, staff and students thank you for strengthening our ability to inspire lives and transform business. 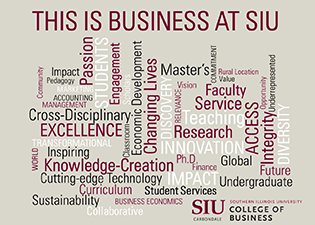 For more information on how you can contribute to the SIU College of Business, please contact Jill Gobert at jillg@foundation.siu.edu or visit business.siu.edu/contributors.